TICKETS AVAILABLE March 24 at 3PM AT BOO BOO RECORDS AND AT ALL VALLITIX LOCATIONS. Advance VIP, General Admission, and Student tickets at Boo Boo Records in SLO and all VALLITIX outlets. Order online at www.vallitix.com or charge by phone at 888-825-5484. Blankets and low-backed beach chairs (2' or less) only (very limited space 1st come-served). No high back chairs. Children under 10 admitted free when accompanied by paid adult (one child per one paid adult). Rain or Shine. No umbrellas. No pets. No cameras. Beer & wine available for over 21 with ID. Please no outside food or beverages. Food and beverage for purchase inside venue. Ins and outs ok until 6PM. Subject to Search. A portion of the proceeds benefit the future Summer Jazz Workshop and SLO Jazz Festival, a 501(c)3, and all the community charities it serves. Two BOX OFFICE ENTRANCES: first by San Luis Obispo Museum of Art on Broad Street and WILL CALL by Monterey and Choro. Two TROLLEY STOPS: (1) By Higuera just after Broad and (2) Monterey at Morro (closest) with expanded hours and trolley cars from 10:30AM to 10:30PM. Note: Mission de Tolosa San Luis Obispo has ample parking structure spaces nearby. Note that parking meters around town have a TWO HOUR limit - make sure you don't run out of time! PLEASE NOTE: WE HAVE ADDED A NEW STAGE IN 2017! 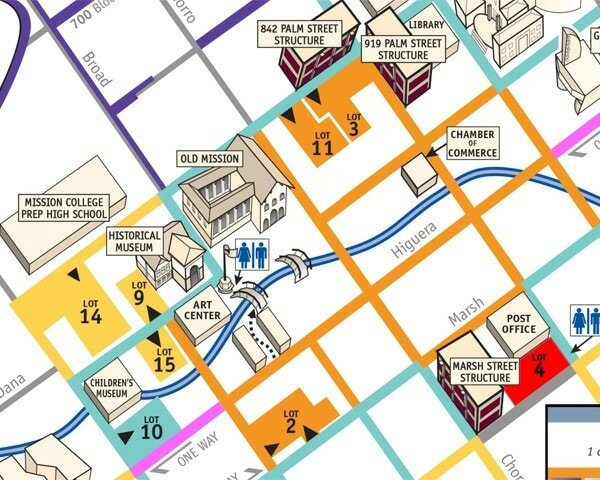 ADA Parking will be by the Natural Museum of History Parking Lot marked at 680 Monterey St. Please advise us if you have ADA requirements so that we may make special arrangements for you with seating and/or entrance to the Festival - we care about going the extra mile for you! The BOX OFFICE is located at 680 Monterey and by Monterey and Choro, just inside Festival Grounds. 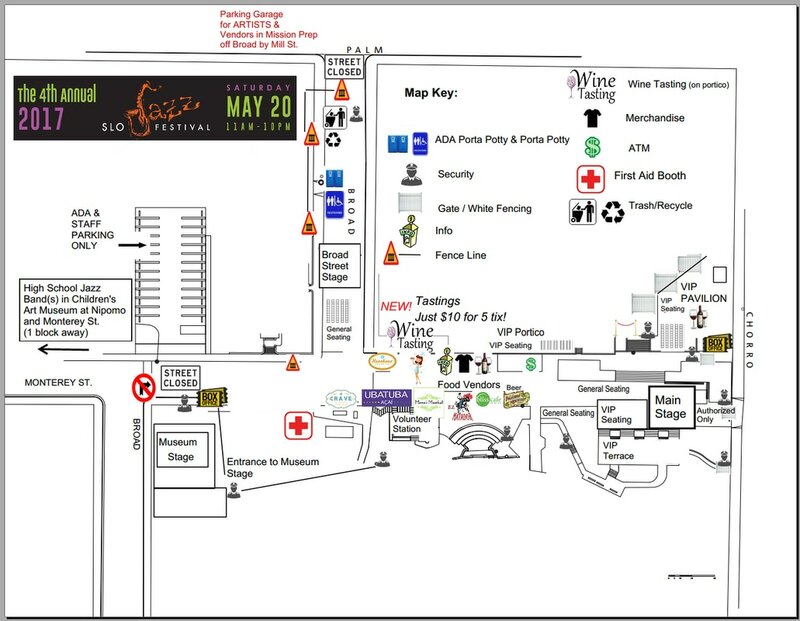 Only ADA and Festival STAFF may make a right turn from South Broad into the lot at 680 Monterey the entire day of Jazz Festival. We also recommend bicycle valet at the main SLOMA ticket entrance by the ticket entrance near Monterey and Broad (nearest to SLO Museum of Art). Note: NO INS and OUTS AFTER 6PM! Please note that most jazz festivals do not allow INS and OUTS at all. We do because there is no way you can go to the Children's Museum unless we allow INS and OUTS. Our policy of NO INS and OUTS (which means "no re-entry") AFTER 6PM will be strictly enforced this year. If you have a strong reason for exception, please contact the SLO Jazz Festival Office PRIOR to the Festival, to coordinate with our team (we're not trying to be jerks about this, seriously). The reason for our no re-entry at 6PM policy is we want our patrons to support our FOOD & BEVERAGE VENDORS. We make high effort to ensure good food choices, and 2017 will be the best food yet. Please support our food vendors so they have a good day, make money, and want to come back in 2018! Your support matters! Thank you!